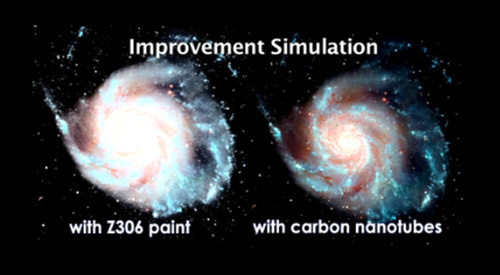 Why Did NASA Create a Material Ten Times Blacker than the Blackest Black Paint? NASA Goddard Space Flight Center scientists have created a new material that is ten times blacker than the blackest black paint in the world. It's made of carbon nanotubes grown on titanium. Why does NASA need this material? Once it goes through some manufacturing fine-tuning, the new material will be used to coat the guts of cameras and telescopes in space. Right now, these instruments use NASA's Z306 paint, a pitch black painting that reduces photon contamination by absorbing errant light. According to NASA, this light "has a funny way of ricocheting off instrument components and contaminating measurements."